This roasted shrimp and asparagus salad is light on the mayo but BIG on flavor resulting from a quick roast in the oven and loads of herbs. Every year summer rolls around, I vow I’m going to make more salads – both leafy green salads and more of the traditional bbq party salads as well. Leafy green salads topped to the max with the best summer veggies around never seem to be a problem. Pasta salads are fine too. It’s more that the mayo-based mac-potato-chicken versions seem to evade me. I’ll be honest – globs of mayonnaise do nothing for me. Yep that’s right, my grandmother’s famed potato salad will be a recipe that gets lost at my branch of the family tree. And I don’t feel a bit bad. But I made an apple pecan chicken salad a few years back and got intrigued about the idea of making these types of salads my own way – very light on the mayo and big on flavor. So this roasted shrimp and asparagus salad takes two of my favorite ingredients, cooks them using one of my favorite methods, combines them with a ton of fresh herbs, and adds a little mayonnaise and some Greek yogurt just to hold everything together. Yeaaaahhh, then top a split buttery and flaky croissant with this salad and you’ve got a blissful sandwich for lunch or a light dinner. Call me crazy but I seriously never thought I would ever refer to salad like this as blissful, but it certainly is and I’m totally selling myself on this non-traditional salad idea now. Instead of roasting, you can grill the shrimp and asparagus instead. There's no need to add salt to the shrimp and asparagus before roasting or grilling - the shrimp are salty enough on their own. 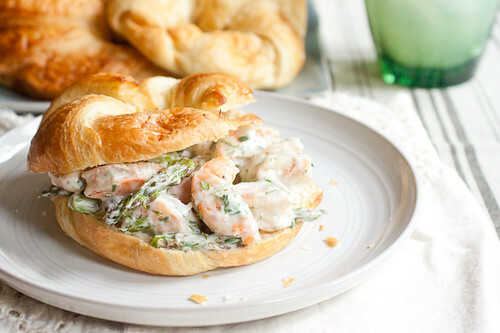 Preheat oven to 425° F. Lay the shrimp and asparagus out on a parchment-lined baking sheet. Drizzle with olive oil and sprinkle with black pepper. Roast for 7 minutes. 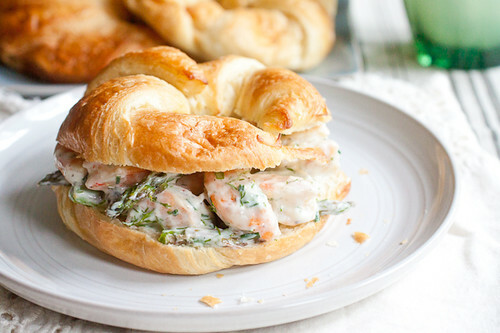 Allow the shrimp to cool for 5 minutes then cut them in half, if desired. Cool the shrimp and asparagus to room temperature or chill for up to 2 days before proceeding. In a medium bowl, whisk the mayonnaise, yogurt, lemon zest and juice, vinegars, salt and 1/8 teaspoon black pepper together. Stir in the dill, parsley, and chives. 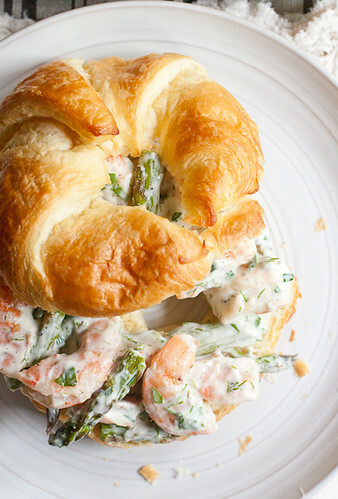 Fold in the cooled (or chilled) shrimp and asparagus. Season with extra salt and pepper to taste. Tara, you’ve combined two of my favorite ingredients beautifully and dressed them in what appears to be a very delicious way. Bookmarking! This salad had two of my favorite ingredients: shrimp and asparagus! I cannot wait to try this!